The Young Child is not sitting or lying down, but reclining to represent that He is not only the Great God or just a mere man, but simultaneously contains both Divine and human natures. Jesus’ youth is portrayed by the lack of a beard, but the Divine Infant’s facial features are those of an adult to portray that although He was born on earth as a little baby, He was always consciously the All-Knowing God. In Christ’s halo are the Greek letters for “I AM” to remind us that this Infant is the God Before Time and is also the Peace of the World. In His left hand He hold a prophet’s scroll to symbolize that He is the fulfillment of the prophets’ words. 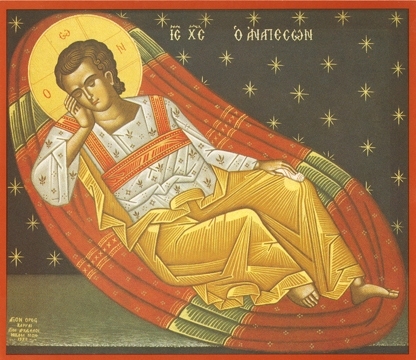 The “Anapeson”, or the Reclining Child Jesus on a couch, is a version of the famous 14th century fresco by Manual Panselinos, the foremost representative of the Macedonian school of iconography. This theme is inspired by Genesis 49:9 “Judah is a lion’s whelp…he stooped down, he couched as a lion…” which is considered as a prophecy of Jesus, the Lion of the Tribe of Judah. This particular icon is traditionally found on the west wall when present in an Orthodox temple.